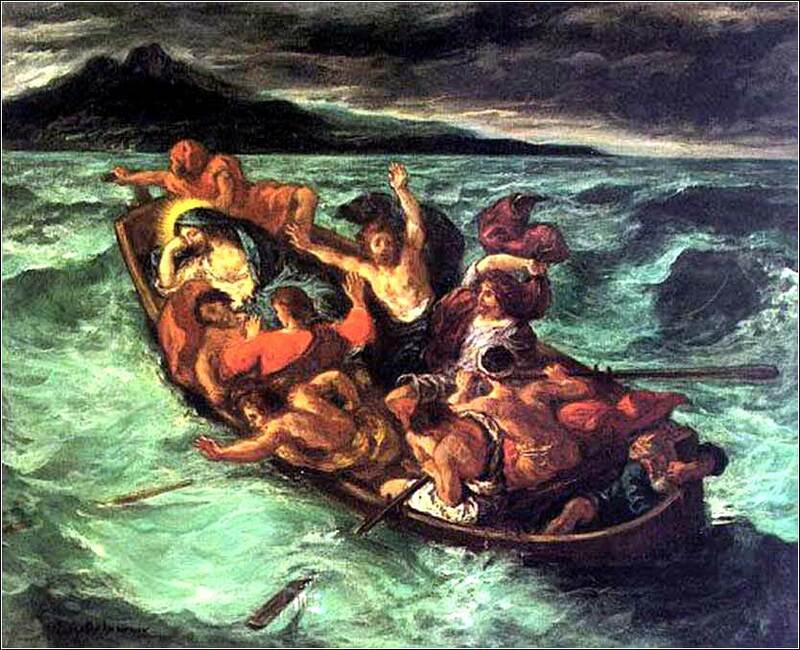 Christ on the Lake of Gennesaret by Eugene Delacroix, ca. 1854.
Who could possibly sing this spiritual comfort-food better than Anne Murray? 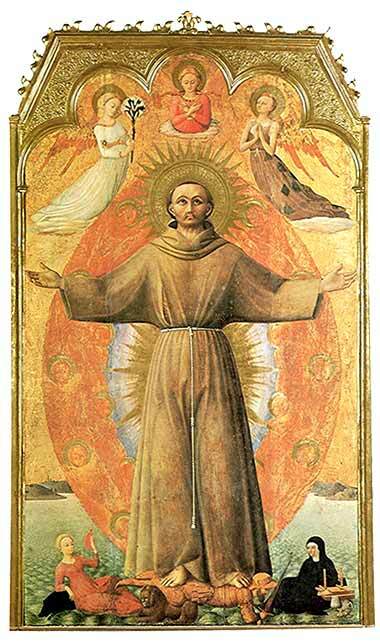 St. Francis in Ecstasy by Il Sassetta, ca. 1444. 15-18 This was a promise of God, a testament established 430 years before Moses; so how could the Law nullify it or add to it, so as to invalidate the promise? Even in the world of men, nobody nullifies or adds to someone’s last will and testament. If our inheritance came from the Law, then it did not come from a promise; but this is impossible, because God’s promise to Abraham was not revoked. 15 Brothers, even in human terms, when a testament aOr covenant. has been ratified nobody nullifies or adds to it. 16 Now to Abraham was said the promises and to the descendant of him. Not says it, “And to the descendants,” as for many, but as for one, And the descendant of you, who is Christ. 17 And this I am saying, covenant previously-established by god the after four-hundred and thirty years being-established law not annuls, in order to invalidate the promise. Our study of Galatians is, as promised, what scholars today call “granular”: tearing it down and examining tiny details. We looked at some true minutiae in the previous commentary; but we don't want to miss the forest for the trees. So what does Gal. 3:15-18 mean in broader terms, for our faith today? he Jews considered themselves the children of Abraham. It was the very essence of their racial and religious identity. The broad message of Gal. 3:15-18 destroys this fundamental tenet of Jewish belief. It is not the Jews who are heirs of God's favor, but those who hear the Gospel in faith, whether Jew or Gentile. One proof he uses is the precise language of the (Hebrew) Scripture. God told Abraham he would honor His promise not only to Abraham, but to his descendant — not his descendants, plural, but to his descendant, singular. One person would inherit; and this person was Christ, the descendant of Abraham by blood, and the Son of God by spirit. The Law, as we saw previously, could not affect or alter God's promise. Christ, possessing God's promise to Abraham as the sole heir, then named all who loved Him as His own heirs. We became heirs with Christ, the adopted children of God. We have been shown that any attempt to attain righteousness before God by our own actions is futile. This was the purpose of the Law of Moses. We must understand the futility of our attempts to become so good that God will favor us. Our salvation is not and cannot be the product of our strivings. The Law humiliates us, in the sense of creating an absolute humility. From our realization of our sin comes humility, and from our humility comes our realization that only God can save us. For God has saved us. He has delivered on the promise He made to Abraham, by giving His Son, Jesus Christ, as a sacrifice to cleanse us from our sins. Paul's language to the Galatians is rather harsh in places, but through it we find the sweetness of the gospel and the most blessed comfort possible. All that is required is our faith in God's promise. The law says: Do this. The gospel says: Accept this. Whatever our roles and experience in life, we can see our many failures in all sorts of ways. Satan wants to use these failures to discourage us; Paul tells us that our failures are inevitable and meaningless: we cannot earn salvation by success and we cannot lose it by failure. Job 1:21: Naked I came from my mother’s womb, and naked shall I return. The Lord gave, and the Lord has taken away; blessed be the name of the Lord.